도기 말머리장식 뿔잔(陶器 馬頭飾 角杯)은 부산광역시 동래구 복천동 무덤들 중 제7호 무덤에서 출토된 말머리 장식의 뿔잔(각배)이다. 각배란 본래 쇠뿔과 같은 동물의 뿔(각)로 만든 것을 말하지만, 넓게는 흙이나 금속 등으로 뿔잔의 형태를 본떠 만든 것도 포함시키는 것이 일반적이다. 신라·가야 지역의 무덤에서는 여러 형태의 뿔잔이 다수 출토되었는데, 이 뿔잔은 그 중에서도 뛰어난 걸작이다. 이 뿔잔은 큰 것이 높이 14.4㎝, 길이 17㎝, 작은 것은 높이 12.1㎝, 길이 17㎝로 크기가 서로 다르지만, 전체적인 형태와 제작 수법은 거의 동일하다. 뿔잔의 밑부분 끝에 말머리를 빚어 붙이고, 그 뒤쪽으로 조그만 다리를 2개 붙여 넘어지지 않도록 하였다. 말머리의 전체적인 형상은 귀·눈·코 등 말의 특징적인 표정을 잘 나타내고 있다. 뿔잔의 표면에는 조각칼과 유사한 도구로 깍아 다듬은 자국이 남아있다. 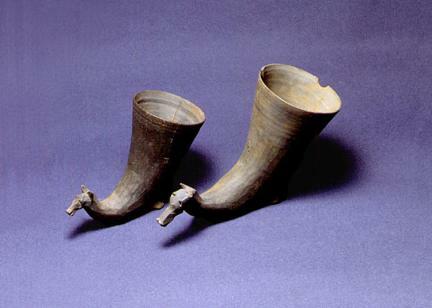 These two horn cups with a horse head decoration was excavated from the shell mound in Bokcheon-dong, Dongnae-gu, Busan (Tomb No. 7). Both cups that are actually made with an animal horn and earthenware or metal cups in the shape of a horn are referred to as gakbae (horn cup) in Korean. Horn cups of various types have been discovered, in great quantities, in graves located in areas that were former territories of Silla and Gaya. These two horn cups are arguably the best of them and masterpieces of their kind. The larger of them stands 14.4㎝ tall, measuring 17㎝ in length, and the smaller one has a height of 12.1㎝ and length of 17㎝. Aside from the difference in size, the two are overall identical, both in shape and the way they were crafted. A horse head is at the tail end of the cup which is held in upright position by two small feet located under the bottom arc. The horse head, although simple and even somewhat crude, expresses well the characteristic features of a horse. There are traces left from the use of a sculpting knife on the surface of the cups.